Front is an efficient tool for combining all of your team's communication channels. They provide team-by-team analytics that you can use to track your team's analytics. But creating a view of metrics across all or a handful of teams cannot be done. With the Front Import, Parabola can pull any analytics that Front offers, across any number of teams. Track a north star metric across all of the teams you are interested with ease. This flow demonstrates the power of the Front Import. By selecting the analytics that you are interested in, and the teams from which to pull those analytics, the Front Import will compile a list of the exact data you are looking for. Utilize the power of Front's API without any code or set up time. With this data, you can create custom reports that are delivered to the relevant stakeholders via email, or displayed on a large screen through Geckoboard. 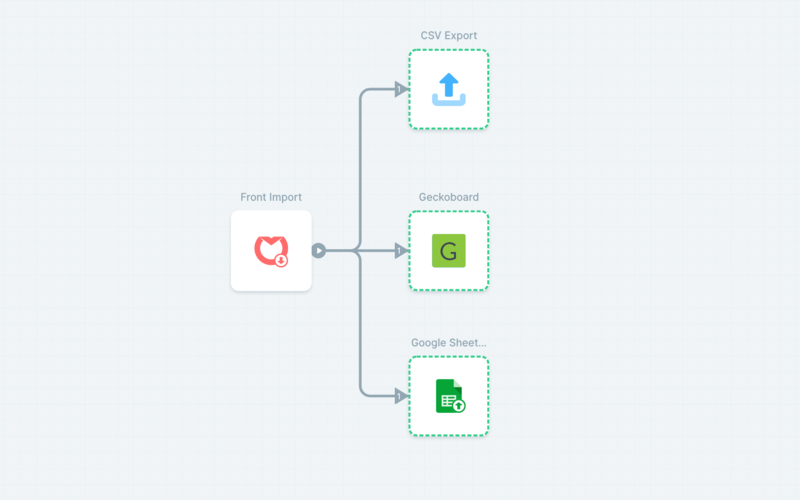 In this flow, Front analytics reports are pulled in with the Front Import. You can specify which teams, tags, and analytics reports are pulled, giving anyone easy access to a powerful source of data.